Increasing your reach and fans on Facebook is about 1 key thing, affinity with your existing fans. The more comments, likes and shares you have, the higher the chance your content will appear in your fans timelines. Just sharing links and photos isn’t enough to stimulate activity, which is why content design and creation for Facebook is key. With the launch of reply to comments on Facebook pages a few weeks ago, this made having conversations on Facebook pages easy as people can respond to specific comments. So what is a Facebook Chat? It’s a virtual conversation where people come together on a Facebook page to discuss a comment topic using the comment functionality. How do I set up and promote a Live Chat Session? You need to give people a reason to join the session, so getting in a key speaker or someone with enough of an online profile that’s going to have draw an interest. 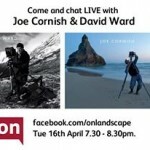 For instance for the live chat we ran we had 2 of the UK’s best landscape photographers running a Q&A. You can’t just have a live chat – you need to focus people’s attention so they can think about what questions to ask. In the OnLandscape example, Joe and David kicked things off talking about their latest trips and photographs. People then started asking questions around composition, what cameras they used. Pick an expert with a good understanding of the topic you’ll be talking about. If they have a good online profile this helps too as you can capitalise on that for promoting the event. We created a graphic which mentioned the time, date, speakers + topic. This then got posted on the wall and people started posting their questions. We also tweeted out the link to the Facebook posting using the relevant hash tags and also emailed our membership of OnLandscape. The speakers also promoted the Facebook chat through their website, email campaigns, Twitter and Facebook. We created a dedicated web page for this, whether that is a news article or page on the site, this needs to have a sign up form on it, so you can send a reminder to people shorting before the start of the session. We logged onto the Facebook page ahead of time to welcome people to the session. We did 2 half hour slots, so people could follow both threads of conversations. Whilst the speakers answered the questions, there was a moderator picking up questions off email and Twitter and feeding these into the Facebook session. After the session all the questions and answers were then copied in to a blog post and including in the email newsletter to all members. This entry was posted in Community Management, Social Media and tagged community management, Facebook by Charlotte Britton. Bookmark the permalink. You can use either the email address to the left or the contact form below..